Flag of Ministry of Defence. This flag was not adopted yet. But probably it will be adopted in nearest future. Flag of Armed Forces of Ukraine ("Zbroyny syly Ukrayiny" in Ukrainian). This flag was not adopted yet. But probably it will be adopted in nearest future. Flag of Land Forces ("Sukhoputny viyska" in Ukrainian). This flag was not adopted yet. But probably it will be adopted in nearest future. Flag of Air Force ("Viyskovo-povitryany syly" in Ukrainian). This flag was not adopted yet. But probably it will be adopted in nearest future. Flag of Air Defence ("Viyska protypovitryanoy oborony" in Ukrainian). This flag was not adopted yet. But probably it will be adopted in nearest future. Ukraine seems to be following the Soviet practice (still maintained in Russia also, I believe), of dividing its air force into seperate tactical and air defense service branches. Thus there is no single "Ukrainian Air Force". This is the Flag of the AIr Defence. Most ex - soviet allies maintain four arms of services: Army, Air Force, Navy and Air Defence. On the site of the Ukrainian Armed Forces, this appears clearly. The blue flag with three arrows is NOT the border guard flag, but the Air Defence Force flag. [My translation using an Ukrainian-English dictionary] This is a continuation of the Soviet practice of maintaining seperate air force and air defence force. 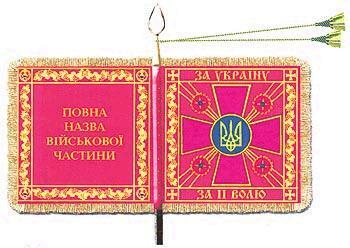 Colour for military units - The motto on the anverse side (right side on this image): "For Ukraine, for her liberty". Full name of military unit on the reverse side. This flag was not adopted yet. But probably it will be adopted in nearest future. In the "prototype" image above the reverse text reads literally "full name of military unit", supposedly to be replaced with appropriate name in real flags.